You know what they say—parents know best. And locals know even better. That’s why we were thrilled to announce that Bend’s coolest moms, dads and rockstar patients voted for Struble not once, not twice, but 3 TIMES as The Best Orthodontic Practice in Central Oregon for 2018 and 2019. A huge shout out to our amazing community for making us a favorite of Bend locals and newcomers alike. You are the reason we come to work every day with huge smiles on our faces. We wouldn’t have it any other way. You guys rock! Bend Lifestyle Magazine’s Reader’s Choice 2 Years Running! Bend Nest Parenting Magazine’s Reader’s Choice 2 Years Running! You make us look good and help our practice make a lasting impression! Speaking of impressions, did you hear about our new Impressionless Digital Scanner technology? You know, the kind that gives us instant 3D models of your mouth without the hassle those gooey impression trays? It’s worth checking out if you need a custom appliance made. The goal of having great technology is to minimize your time spent in the chair so we can get you out the door for life’s most important appointments—like that “board meeting” up on Mt. Bachelor. Again, THANK YOU for helping to spread the word about our practice. When you come in for your next appointment or if you’ve recently been in to see us, don’t forget to high-five one of our many excellent coordinators, orthodontic assistants, and doctors—who make the magic happen. Whether you’re from Bend, Redmond, Sisters, or somewhere in between— we cherish your business. And just so you know, you‘re our favorite too! Impressionless Digital Scanners, Oh my! Guess what, Struble patients! We’ve got some fancy new technology in the office that we know you will just love. You know that uncomfortable feeling of having to sink your teeth into a cold, gooey dental impression tray and hold still? Those days of awkward fitting, strong- smelling dental impressions are over. Why? Because we have 3 brand-new iTero ® Element Scanners in our offices. Check out this video to see exactly how they work. Your comfort is one of our top priorities at Struble. Have a top-notch fitting experience for retainers and Invisalign® aligners with this new technology. No one will miss the old way of doing impressions with putty-based materials that were awkward fitting and messy to clean up. There are clear benefits for switching from manual impression trays to digital scans. Goo, be gone! We know how awkward those old-school impressions trays were and we are proud to eliminate that hassle to provide the best possible experience for our patients. We know you’re going to love it as much as we do. 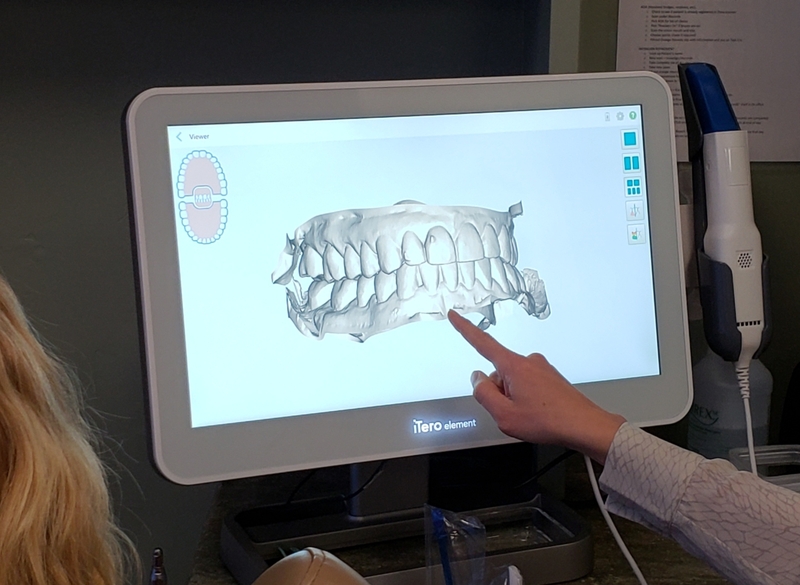 Get in and out of the office in a flash because now you can see 3D scans of your mouth on screen immediately and review with your orthodontist. In some cases we can even provide an immediately treatment simulation to view your future smile transformation digitally! Get going on your Invisalign® plan without having to wait for clunky impression to set. It’s not too good to be true! Our 3D scanners (we have three!) means no need to retake messy impressions or hassle with the aftermath of putty ever again. Hooray! This 3D model of your mouth can be used over and over again for fitting purposes. Our Struble patients can take advantage of this highly accurate and efficient 3D method of scanning right now. Our highly trained team can complete your scan in only 3 to 4 minutes! No hassle or messy cleanup of putty residue. Everyone wins! We are proud to continually provide Central Oregon with this exceptional digital scanning technology. Come check it out at your next appointment with us. 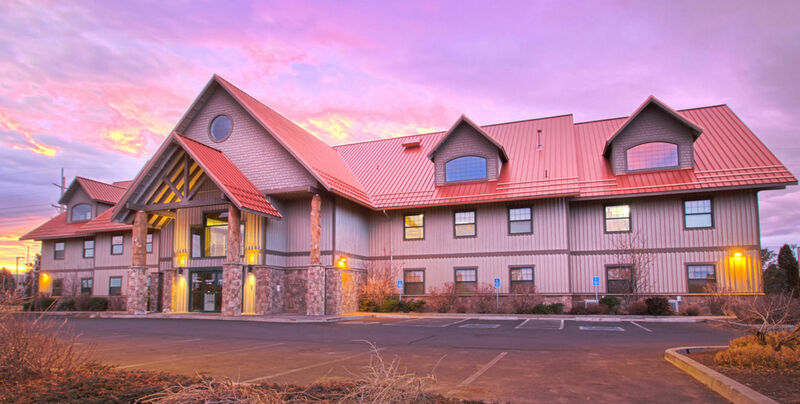 Struble Orthodontics is thrilled to announce the opening of a second Central Oregon location to better serve our patients commuting from Redmond, Terrebonne, Prineville, Sisters, Madras and beyond. We’re offering everything our Bend location has including top-quality full-service specialty orthodontic care for children and adults. As a bonus there will also be pediatric dental care available onsite from the experienced and talented team at Deschutes Pediatric Dentistry! We offer an individualized, compassionate, comprehensive orthodontic experience and are bringing our services to Redmond to offer more options, better access, and to make your trips to see us both convenient and enjoyable. You asked. . . . and we listened! Many of our patients have been traveling long distances to see us. . . . we appreciate that sacrifice and we want to serve you better! 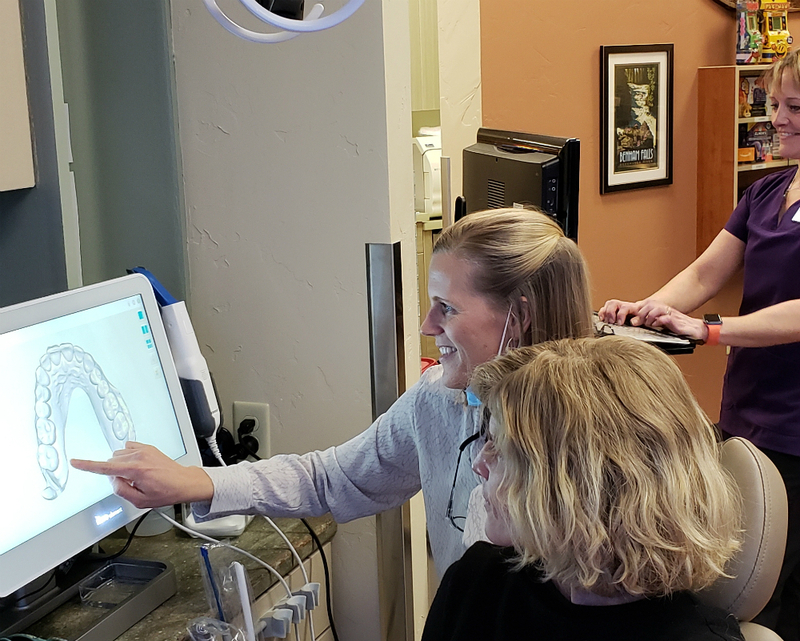 Part of the vision behind expanding to Redmond is to make orthodontic care more accessible to those living outside of the immediate Bend area. This is why we chose a highly accessible location off Highway 97 and Airport Way in the Coppertop building in Redmond. As the population growth of Central Oregon continues to grow, we hope to be the primary point of service for new and existing patients seeking outstanding orthodontic care through the expansion of our staff and services. A second location allows us to better serve our existing patients by bringing our top quality care closer to home AND we are thrilled to meet new people and new patients in Redmond and the surrounding areas! Is our Bend location going away? Not to worry, we are here to stay! The original Struble Orthodontics location will remain in the Old Mill District. We are simply adding a second location in Redmond to allow better access to our outstanding orthodontic care and services. How do I book an appointment at the new location? You are encouraged to book appointments now through our regular Bend office until we are setup in Redmond, but please come and see us when we get moved in at the start of 2019. The clinic is beautiful and we cannot wait to share the new space with our patients and friends! Dr. Struble, Dr. Crosta and the entire team are looking forward to seeing your smiling faces soon! Will I still get to see the same doctors and team members in Redmond? Yes, of course! While Dr. Struble and Dr. Crosta can’t be in two places at once, they will both be balancing their time between the two locations. We are not taking time away from our Bend location but rather adding days for both doctors in Redmond. And you can certainly expect to see the same smiling faces on our team in the Redmond location. We have several team members who live close to our new location and they are thrilled to take care of patients close to home! Dr. Struble plans to start seeing patients in Redmond the first week of January 2019! The details again in case you missed it! Where? Located off Highway 97 and Airport Way in the Copper Top building. Give us a call today to book an appointment: 541-527-4325! The decision to improve your smile is hard for many of us. How will braces feel on my teeth? How long will I have them? Is it worth it? 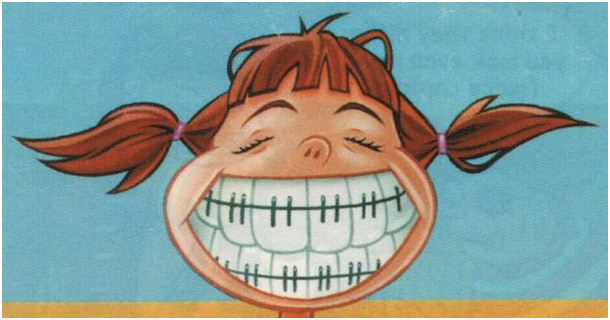 All might be questions you ask yourself--especially if you are an adult who’s lived with smile-insecurity or uncomfortable dental challenges for some time. However, the good news is that braces are no longer the only option! Invisalign® is the most advanced, clear aligner on the market, and with Invisalign® you will be able to cut down on the time of your treatment, the inconvenience of braces, and get the beautiful smile you’ve always wanted. Is one of the significant barrier keeping you from talking with your orthodontist the time needed for treatment? Well, we have good news for you. The time required for treatment with Invisalign® versus braces may be much shorter. Of course, talk with your orthodontist to get a full assessment, but the quicker treatment associated with Invisalign® is a primary reason many of our patients (especially adults) choose Invisalign® over braces. If you work in a public-facing job or don’t feel super comfortable with the idea of how braces will look, Invisalign® could be the perfect solution for you! The clear aligners are virtually invisible, making this treatment option for straighter teeth a no-brainer if visibility is one of your concerns. With aligners made from SmartTrack material, you’re bound to be pleased with the flexibility and fit. Plus, you’ll have the ability to remove your aligners as needed to brush and floss your teeth, as well as eat your favorite foods. One of the biggest reasons patients feel hesitant to take steps to improve their smile is the inconvenience that comes along with braces. Invisalign® is a convenient and simple option that allows you to visit your orthodontist less during treatment but still get beautiful results. Plus, since you can remove the aligners when needed, and continue to live your life while your treatment is taking place, the Invisalign® option is perfect for working adults, parents with busy schedules, and young adults with lots of time constraints. Bottom line, if any of the barriers above is keeping you from getting the smile you’ve always wanted, now's the time to break through that barrier and try Invisalign®!